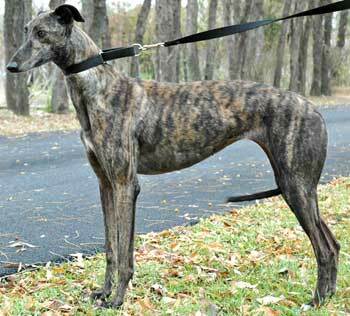 Lulu, aka NXS Lukie Loo, is a precious 2-year-old dark brindle female, born June 16, 2002. Lulu's sire is Gable Luke, making her grand sire Wigwam Wag and her dam is Minaki Mama. She is littermate to Evie. 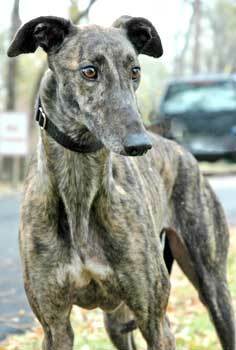 Lulu's racing career started at Ebro, Florida, on July 19 and ended August 21, 2004, so you can see she was no contender in the racing arena, but as a companion pet she is a winner! Lulu is small animal and cat tolerant. Lulu is beautiful, a little shy and very loving . Shes quite inquisitive about her new environment  the house. Lulu seems to love to explore both indoors and out. She was quite curious about the cats, but now ignores them. If she does decide to give them a sniff, shes very gentle and respectful. When a house guest came over she came out of her crate to check them out and leaned in for all the affection she could get. She likes the crate and is a hearty eater. Whoever adopts Lulu is going to have a gentle, sweet, loving greyhound in their life.